This morning we all woke up at 6:30am to get ready to run the 2011 Turkey Trot. It was a perfect morning for the kids to try their hand (and their legs) at their first ever race. It was about 40 degrees at 7:30am when we arrived in downtown Miamisburg—It couldn’t have been a better temperature for a race this time of year. I left Jeff and the kids at the 1 mile kiddie race area and headed to the start line to join the throngs (yes, throngs) of people who had woken up equally as early to run 5 miles with the rest of us lunatics. I found the group of people hanging out by the sign that said “will run the race in under 50 minutes” and jumped under the rope to join them in line. It felt like an overly optimistic choice at the time, but I thought “what the heck?”. The national anthem was sung by what sounded like an Elvis impersonator at a few minutes before 8am. At exactly 8am, the gun sounded, and we were off——-well sort of . Those of you who have never run in a race with multiple thousands of people may not understand how a start gun sounding can be such an anticlimactic moment. You get all excited about running, and then you walk, walk, walk, nose to tail ( or toe to heel) for the next few minutes until the crowd disperses a bit. I checked my watch to see exactly when I began running, and then I turned on my ipod. For some reason, my ipod has dropped almost my entire song list over the last several weeks. On my run last night I was down to only a few songs, all of which were very slow, very sleep provoking, Christian tunes. Great songs for communion and nice relaxing walks on the beach, but not so beneficial to the running. Jeff helped me retrieve all of my songs off of his computer last night, so this morning I felt as if I had been reunited with all of my old friends. Mile 1 felt like a breeze. I was so busy listening to my tunes and trying to dodge people’s feet that I practically missed the first timer. The timer said 12 minutes, which was based on the time they fired the gun. I figured I had run the first mile in a little over 9 minutes. Great! My goal was to run 5 ten minute miles, which isn’t great if you’re trying to get to the New York Marathon, but for a nearly 40 year old “non-runner” who makes herself run so that she is in good enough shape to ride well, I’d say “good enough”. Mile 2 also felt pretty good. I was starting to get into a rhythm, and I hit the 2 mile marker at 22 minutes and some change. So far, so good. Between mile 2 and 3 we got into a bit of a bottleneck on the course and were back to running right on top of each other. Runners were starting to get tired and began walking ….sometimes with no warning……right in front of you…..fun. As I approached the 3rd timer I realized that all of the “mass running” had slowed me down. I had lost 2 minutes. The timer read 34 minutes, and I wasn’t real thrilled about it. I decided to try to make up some time on the 4th mile. Picking up the pace just a bit, I was determined to get back on track to finish at 52 minutes (50 by when I started running.) I pushed myself a little harder than maybe I should have, but by the end of the 4th mile, I was back to where I wanted to be. The timer read 42 minutes…..an 8 minute mile on mile 4. Nice. I was pretty tired starting mile 5. Not sure if I had made the correct decision to run so hard on mile 4, I slowed myself back down to my 10 minute mile pace. I ran the first half of the mile fairly conservatively. When I spotted the finish line about 1/4 -1/2 mile away I started to pick up my pace. I ran hard the last stretch, and I ended up crossing the finish line at 52 minutes and some change—-50 minutes or less from when I started the race. No one was waiting for me with a gold medal. No one threw flowers at me when I crossed the finish line. I didn’t even see a photographer taking pictures of me. I, however, was pretty excited about the race I had run…..and REALLY excited about the fact it was over! Jeff and the kids ran the 1 mile race. Kate finished her race in 10 minutes, but said she could have gone a lot faster if she wasn’t running the first part with Jeff and Wade. Wade finished the race in 13 minutes. He is a true sprinter…..out with a bang and then some walking. He didn’t like the distance. Kate didn’t like all of the people. Jeff had no trouble with the one mile race. When we got home from the race, Jeff went to the reserve for his own 5 mile run……. and I’m sure he got a better time than 50 minutes. 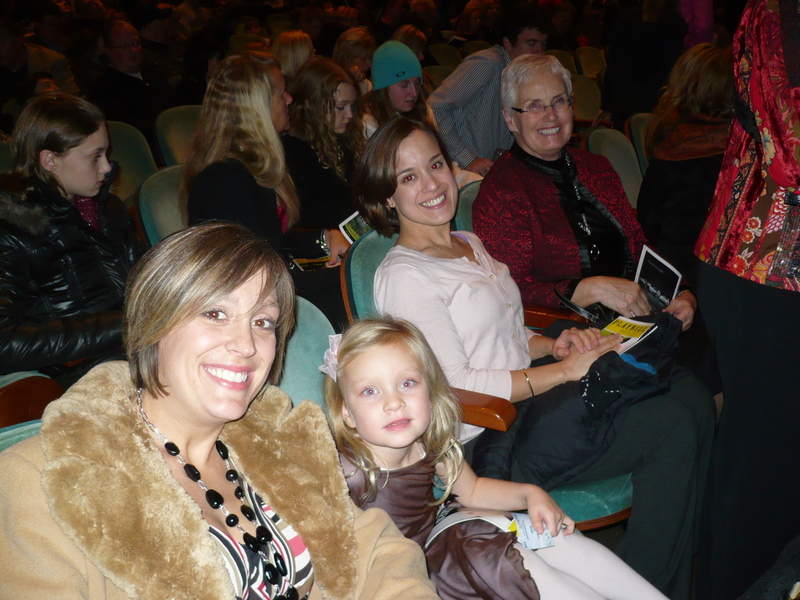 After the horse show Saturday, Kate and I met my sisters in law, one of my nieces, and my mother in law for an evening of dinner and WICKED! 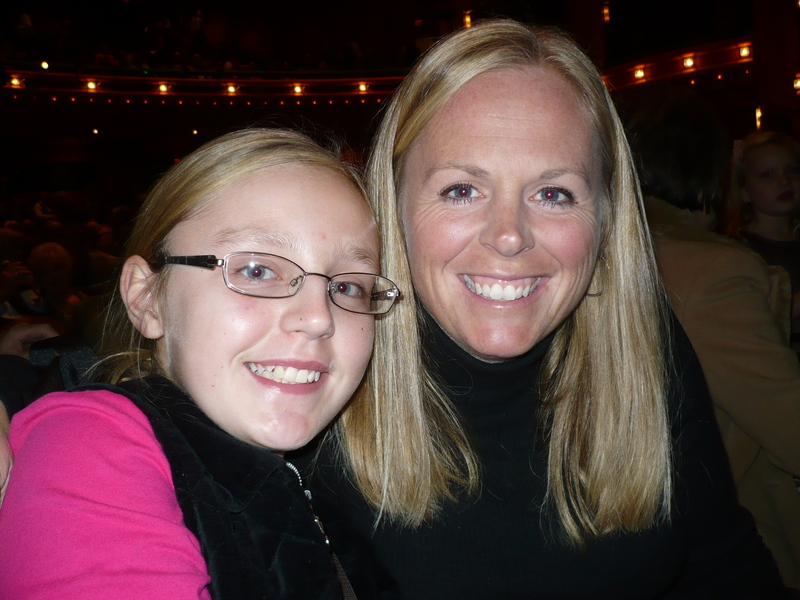 We ate dinner at Champps and then headed to Cincinnati to see the show. We had 2nd row seats right behind the orchestra. 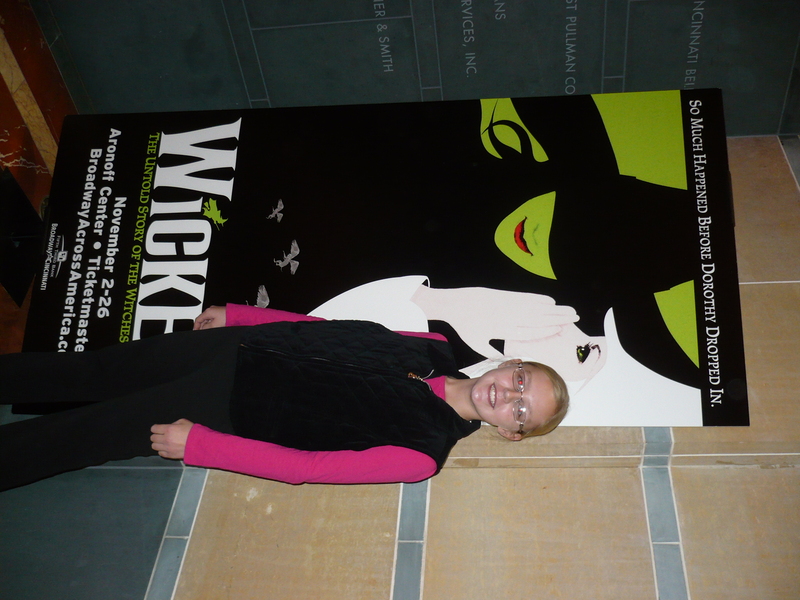 The show was phenomenal, and I’m sure I can speak for all of us that it was a great evening! Thank you, Ann for the dinner and tickets. 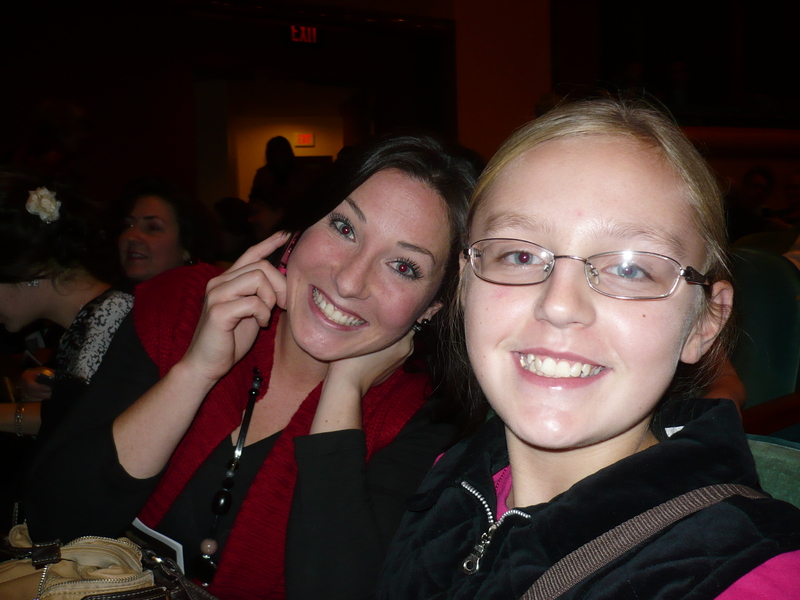 Kate and I had a blast. Kate on her way to meet "the girls"
Julie, Elizabeth, and I woke up really early Saturday morning to get our horses ready to head to Majestic Farm. We arrived at the farm in time to check in, unload our stuff, and walk our stadium courses a few times. 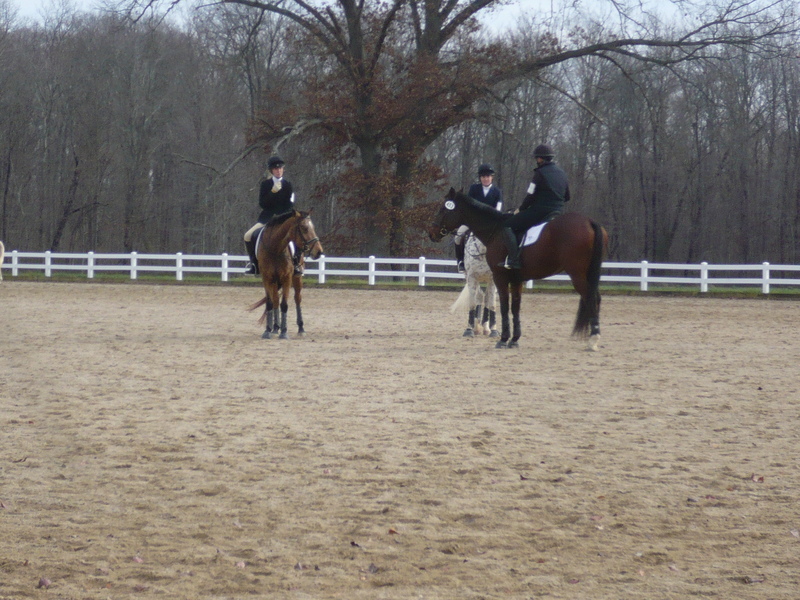 The three of us were competing in the Beginner Novice and Novice divisions. All of our horses warmed up well for the beginner novice dressage test. Sapphie and Julie did a nice first test and ended up with the score of 29.05. Though Sapphie was a little above the bit for most of the test, Julie rode an accurate test with nice impulsion. Elizabeth and Quinn put in a really solid test also. Quinn was consistent in her tempo, and Elizabeth rode a fairly accurate test. The pair received a score of 32.86. Rhyland had been a complete idiot during my ride on Friday, so when he warmed up like an angel on Saturday, I knew I was in for a nice test—-he owed me one! We put in the best test we’ve had so far and earned the score of 30.48. 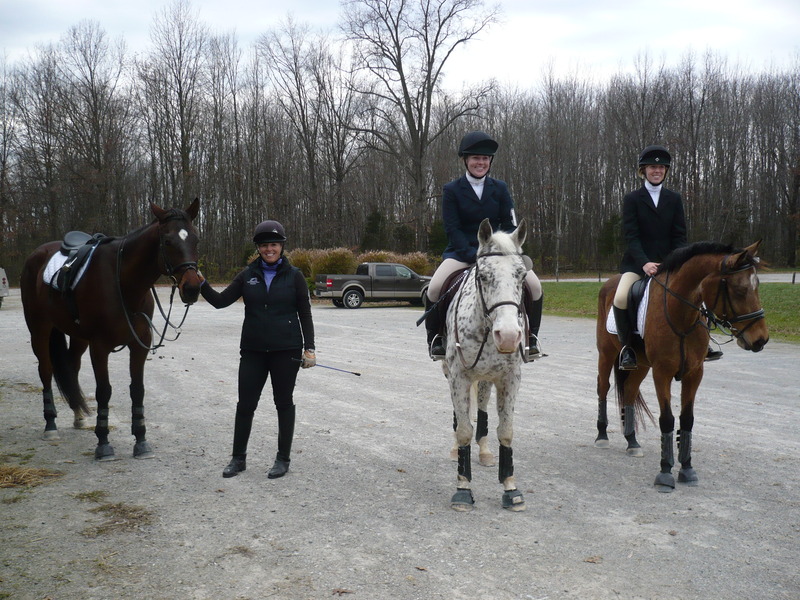 The three Wetherbrooke girls (and their ponies) ended up in 1st (Julie), 2nd (Joy), and 3rd (Elizabeth) after dressage in the Beginner Novice division. 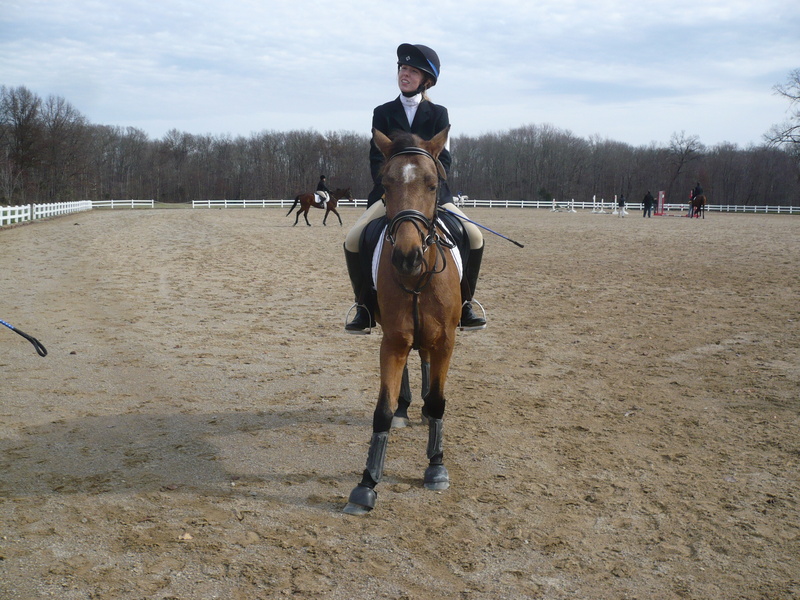 We warmed up a little bit later for our Novice dressage test. Julie put in an even nicer test than before. Sapphie was on the bit for the majority of the test and Julie worked on some position flaws. They received a score of 26.52 which put them into 1st place in the Novice division after dressage. Elizabeth and Quinn received a score of 35.22 on a very nicely ridden Novice test. 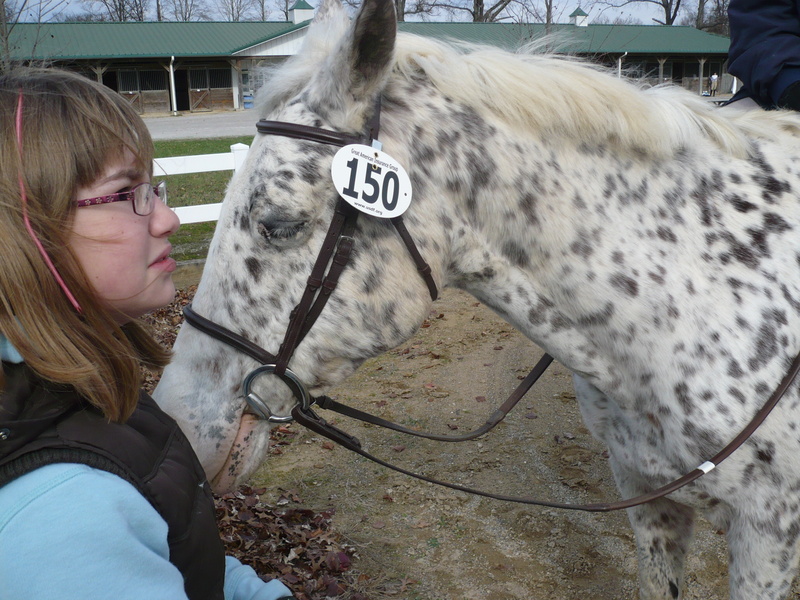 Quinn was absolutely adorable and greatly improved since the last show at the Kentucky Horse Park. Rhyland was not quite as relaxed in the second test, but I was still really happy with his performance. We tied for 2nd place after dressage with Elizabeth and Quinn with a score of 35.22. The stadium jumping warm-up was a bit wild for two out of three of us. Those of you that know us will immediately pick out the “good horse”. Yes, Sapphie. She warms up for like 5 minutes and is ready to roll. Rhyland and Quinn were a different story. 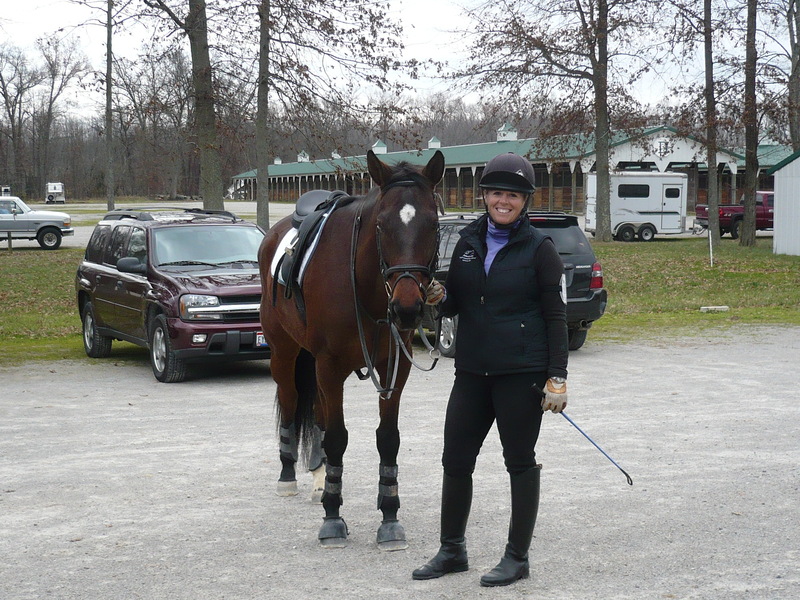 With warm up finished….for now…..we went out and rode our Beginner Novice course. Julie’s first course was fantastic. Sapphie was careful and clean. Elizabeth and Quinn, although a hair (ha ha ha) fast, went clean as well. Rhyland actually had a decent course, but had one rail at fence 6. We ended the Beginner Novice division 1 (Julie), 2 (Elizabeth), 3 (Joy). Not too shabby. The Novice course proved to be a bit exhausting for Sapphie. Julie forgot to ride to fence 1 and 2, but then whipped her horse into shape to finish the course double clear. Great ride, Julie!! Elizabeth and Quinn were super fast but ended the ride with only one rail. Elizabeth rode a nice course according to plan. Rhyland was a bit more out of control the second time around. He came sideways in to a few fences, flung his head in the air most of the time, and caused the judge to gasp a few times. He had a rail at fence 1 and ended the rest of the course clean. We ended the Novice division with Julie and Sapphie in 1st place with a 26.52. Elizabeth and I tied for 3rd place with a 39.22 due to our rails. Overall it was a fantastic day! The girls and I had a blast and walked away thrilled with how our horses performed. Thank you to Kate, Lauren and Jennifer Kelly, and the Montgomery crew for all of your help! We look forward to attending the next show at Majestic Farm. I have no words for this picture!!! It cracks me up---sorry, E! I read an interesting article yesterday that got me thinking. The writer of the article had gone through some really tough times with her career and her business in recent months. Due to these recent hard times, she became extremely aware of the important/detrimental part that people played in her life. She discussed at full length the differences between what she called “A” people and “B” people, and how the lines get drawn between the two types. Her philosophy was simple….”A” people are the people who stick by you regardless of troubled times, they support you and pick you up when you fail, they are happy with and for you when you succeed, they are loyal, and they don’t talk about you behind your back. “B” people are just that. “B” people are jealous of your successes, they secretly begrudge what you have or who you are, they talk about you behind your back, and are quick to leave you when things get tough. They may seem like “A” people, but don’t usually stick around for long. She went on to say that she herself had been a “B” person at times too. I think we all have. I know that I have. People are not perfect. The hard part is trying to figure out who your “A” people are and how to continually let them know how you feel about them. There will always be “B” people in our lives, but they will come and go…..and that will be ok. “A” people will stick it out, through thick and thin, through good times and bad. Those people will be the ones you will cherish throughout your entire life. It was an interesting read that made me stop to evaluate myself and the people in my world. What I have learned is that I am truly blessed to have so many “A” people in my life. Family, friends, students, and clients that have been with me throughout the years. 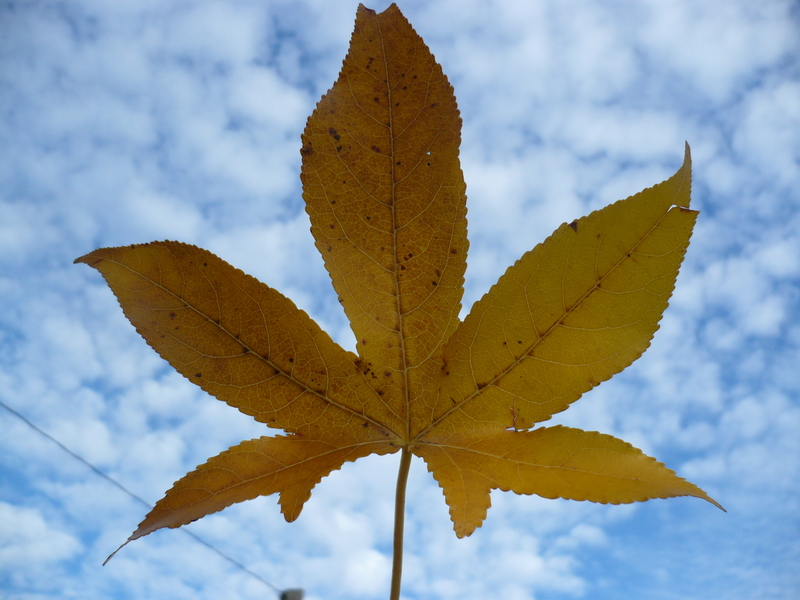 I don’t say thank you enough, but you know who you are……and I appreciate you all . I can only hope that my name is on the “A” list in your book. Gus is doing extremely well getting back into his work . Recently Dr. Miller was out to do fall vaccinations and discuss his back injections. He told me that we would wait to do the injections until we are about 10 days away from our first big competition. Dr. Miller was thrilled with his weight and the fact that he seemed content and relaxed again. Gus has gained about 100 pounds since his last competition. His back feels solid, and so far he hasn’t had any issues with soreness. His dressage has been better than ever, and we will slowly ease him back into the jumping. His eyes are quiet, and he truly seems happy. He needed the break, and I cannot wait to see what’s in store for us next show season. Ride times are posted……it’s official. Rhyland and the girls are headed to Majestic Farm for a combined test on Saturday. All three horses will be doing the Beginner Novice and Novice divisions. We will each ride 2 dressage tests and 2 stadium rounds before throwing our horses back into the trailer to get home before 4pm so that I can make it to “Wicked” in Cincinnati that evening. All three of the horses are jumping well. The dressage is coming along, and we are looking forward to getting another show under our belts. Rhyland will be doing Novice and Training level next spring —if all goes well. Quinn will be moving up to Novice in May. Sapphie will continue at Novice in the spring. We need to get some good schooling shows in this winter and early spring. Pictures and details about the show coming soon! Friday was a bit crazy. I usually ride in the mornings, but this past Friday was a little off schedule. Wade had no school due to Veteran’s Day, so he hung out at the barn with me all morning while I taught lessons. After my 3rd lesson ended, I ran him to my mother in law’s house to play for awhile so that I could get my horses ridden. Jessica was headed out of town and needed to leave by noon, so she just groomed and booted my two guys and put them in their stalls until I got back. Before she left the barn she called to tell me that Gus was galloping in his stall. She said she would check him before she left to make sure he wasn’t getting all sweaty, but she just wanted to warn me…….great. I dropped Wade off in Bellbrook, and on my way back to the barn I got a text from Jessica……basically it said “good luck with that. He (Rhyland) was quiet as a mouse in the cross ties.” Nice….. What that means is that we have noticed a trend in his training. When he’s quiet and relaxed during his grooming, he’s usually an idiot to ride. When he bites the wall and poops 14 times while dancing around in the grooming area, he is an angel under saddle. Looked like it was going to be a great day. I chose Gus first. I sort of expected wild, due to the chilly air and his obvious need to run laps in his stall. He could not have been any better. He did everything I asked of him, and was relaxed in the bridle. We were able to work on our counter canter, our leg yields, shoulder ins, and even a bit of collection. I ended the ride after about 20 minutes, and was thrilled with how well he was coming back after his long break. Then there was Rhyland. Usually when I jump him it requires a crew to fix the fences he scatters. He is what I would refer to as “angry”. He could be fantastic, but he gets so mad when you ask him to listen that he tends to fling his head up in the air and drag me “to” and sometimes “through” fences. I don’t know if he had been listening to me talk about selling him next year, or if the short prayer I sent up before I got on him worked, but whatever it was , he was an absolute dream to jump that day. FINALLY! He listened, he was quiet, he never flung his head up in my face, he came back to me when I asked, and he didn’t lock up his neck and drag me to fences. What a blast! I got off of him with a big smile on my face and a hope that maybe all of the hard work I’m putting in with him is finally paying off. Today was a dressage day for Rhyland. He is starting to be very fancy in his movement, but his attitude is pretty rank at times. There were moments of brilliance throughout his work, and moments when I felt that I was riding a tornado. Just when I start to get really concerned about his lack of submissiveness, he does something spectacular. This horse has unbelievable athleticism, but without submission it means very little. This one major personality flaw could quite possibly limit his career as an eventer. There is no reason he shouldn’t be going training level next summer if he could just get himself together. Until then, he will be a very weak novice horse. Today was Gus’s first day back in jumping tack. Although he was just a bit touchy and jumpy about having my legs hit him in a different spot than in my dressage saddle, he got down to business fairly quickly. We had a really long warm-up, and he felt fantastic! I jumped him over some tiny cross rails, and he thought he had died and gone to heaven. He got pretty wound up over the whole jumping thing (if you can call that jumping), and we had to torture circle on a few different occasions. Overall , he was great and listened very well to everything I asked of him. I gave him several long walking breaks and ended the jump school with a 2’3″ vertical. He was thrilled, and I really enjoyed getting to jump him again. Tomorrow is dressage day for Gus and jumping day for Rhyland. The girls and I just re-designed our stadium course and brought out some new jumps. Though I’d like to say I’m excited about jumping Rhyland over them tomorrow, it would be a bit of an exaggeration. I hope he proves me wrong. Yesterday I spoke with my sister, Ami, about Wade’s interesting interpretation of the first Thanksgiving. Though she thoroughly enjoyed the story, she was left with a need to know more. “I just have to see the drawing he was looking at when he came up with the three stooges. Can you see if his teacher will make a copy of it so that I can know what he was seeing?? ?” I told her I would try to get a copy from the teacher, and we said our goodbyes. This morning I dropped Wade off at school, and I met the teacher at the door. 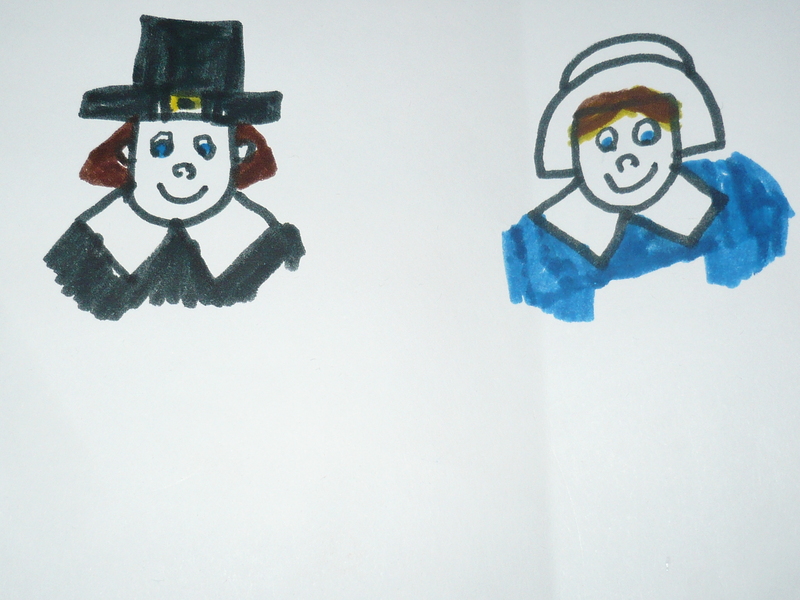 I explained our need to see “the picture”, and she proceeded to tell me that it was just a doodling of pilgrims that she had drawn to show them. She told me that she would draw me a picture similar to the one she had shown to the class. Fantastic! I pulled out of the parking lot looking forward to putting a face (s) to the story. Today when I picked Wade up from my mom’s house I searched in his school bag to see what the teacher had left me. 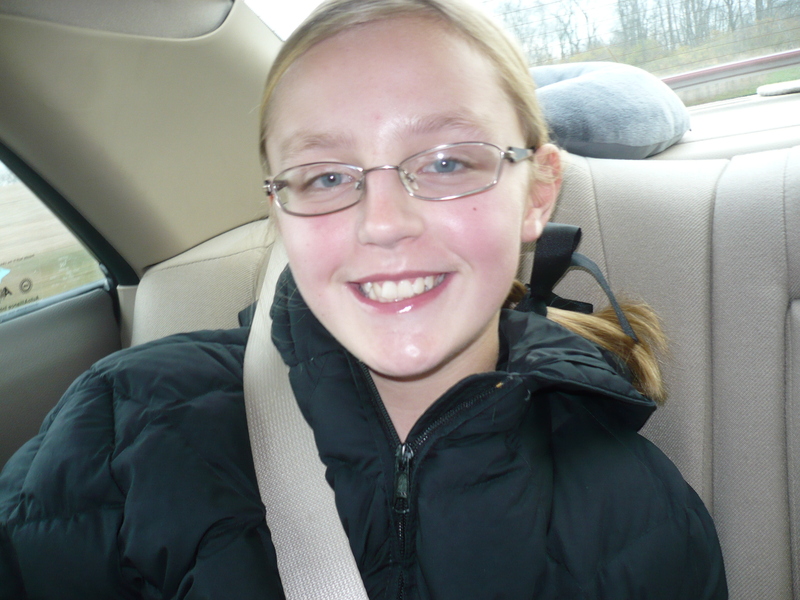 This is what I found……….